A fire in a terrace level apartment was quickly contained and extinguished on Sunday evening. At around 9:30 pm, Sunday, November 29, fire/EMS units were alerted to a fire in an apartment in the 8500 block of Greenbelt Road in Greenbelt at the Gates of Cipriano Complex. First arriving firefighters found a 3-story, garden style, apartment building with fire showing from a terrace level apartment with fire extending to the upper floors by way of exterior balconies. The first arriving engine from Greenbelt and ladder truck from Berwyn Heights were able to quickly contain and extinguish the bulk of the fire which resulted in a stop of fire extension. The terrace apartment suffered the most fire damage. Upon arrival, with the possibility of fire extension to the upper floors a precautionary Second Alarm was sounded but staged and was never used. The extension was quickly stopped with the rapid extinguishment of the seat of the fire. No injuries were reported. The County Citizen Services Unit and American Red Cross assisted four adults and 3 children from the 2 apartments declared uninhabitable. Other building residents were allowed to return to their apartments. The cause of the fire is undetermined and fire loss is estimated at $50,000. Image provided by Bill Corrigan, Volunteer Chief of College Park Fire/EMS 812 and Incident Commander for this incident. 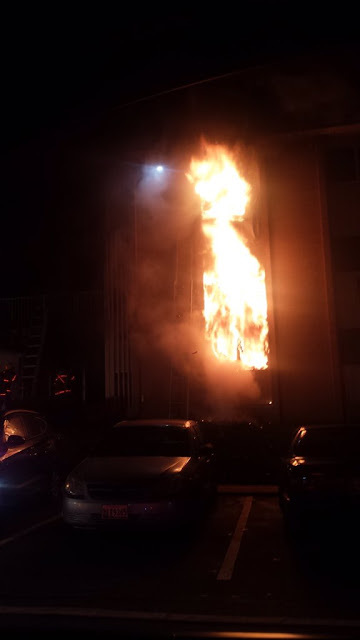 The image shows the fire leapfrogging from the ground floor unit to the upper floors and is easy to understand the need for a precautionary second alarm.